Saturday was the day for the Pulley Point race, which goes from in front of Shilshole Bay Marina, then south to Pulley Point, which I thought was called Three Tree Point, and back. We started in the 4th start at 9:20am. The wind was out of the south and blowing around 20 knots. The whole race was reletivly uneventful but alot of fun. We got down there and back in less than 5 hours. I think we crossed the finish line in 2nd place at around 2:30pm or so. Our foredeck guy missed the race, so I had to replace him. I am the exact oppisite of what you want working the foredeck of a small sailboat, but someone has to do it. Luckily we only had to jibe the spinnaker one time. I flubbed it a little, but not bad for my first time. I really need to get a small cheap digital camara that I can carry with me on these races. There are some awesome pictures to be had out there. Race number two of the year, looked like it was going to be a really slow/wet race. Luckily the rain held off and the wind picked up to about 17 knots of wind out of the southeast. The boat I race on “Gaucho” had an awesome race. We finished well ahead of the other boats in out class, far enough that even with the time we owed the other boats we still got first. I wish I could take a camara on one of these races, but it’s pretty rough out there and I think my camara would get the crap knocked out of it. Monday thru Friday, my alarm is set for the ungodly (to me) hour of 6:15am (ungh). It does not matter if I went to bed at 7pm the night before, when that alarm goes off that early in the morning it kills me. The only thing I hate more than getting up that early for work is being at work later than 4pm. So I’d rather get in and get it over with. Sorta like taking medicine. Just hold your nose and get it over with. Unless it’s Nyquil….maybe I’m odd, but I like the taste of that stuff. Now, on the other hand, if i’ve set my alarm to go off early AM on a weekend for a sailing trip or a day on the mountain snowboarding. It would not matter if I had gone to bed at 3am and drunk as a skunk. I will pop out of bed, get dressed, grab all my gear, keys and wallet and be walking down the dock, hap, hap, happy as hell. This is the scenerio that happened last saturday. I needed to be down on U dock at my friends boat “Gaucho” for a sailboat race. First one of the year for us. The forecast was calling for 10-20 knot winds, but the actual wind turned out to be much, much lighter. It stayed below 10 knots most of the day. I think we saw 12 knots once. We had a good time, and ended up getting 2nd in our class. I think. I have’nt heard what the official times were. This race was nowhere near as chaotic as the one I wrote about back in November. The race was approx. 25 miles. Starting from in front of Shilshole Marina, heading south to Blakley Rock, then back north to a point just off the Tank farm (or so I call it) near edmonds and back south to the start/finish line in front of Shilshole. This map will show you the approximate race course. After the race, I ended up going back to my boat and putting my altenator back on. I had removed it a week or two ago, because I thought it had failed. But after getting it tested and having it pass. I have concluded the issue has to be with the regulator. At least I hope this is the issue. I have never considered myself an obsessive person, neither would anyone that has ever known me. I have never, EVER really strived to be the best at anything. I’m perfectly happy be slightly better than average at just about anything I do. This applies mostly to work, (ehem, if your Googling my name because my resume came across your desk, please ignore that last comment), but it also applies to my hobby as well. We live on a sailboat. On most weekends we will sail our boat to different places or just spend the day sailing around in Shilshole or Elliot Bay. On Wednesday night during the spring/summer/fall I race on a friends sailboat afterwork. Just about every saturday this month will be spent racing on his boat in one regatta or another. Alot of saturdays will be spent racing in September-November after the summer racing season is over. 2-3 week vactions up north to the San Juan Island every year on our boat. Boat show in town? Yep, we are there……both of them. Mine is the green one on the left. I’ve named her ‘Jollypeno’. I’ve got a lot of hobbies. Probably too many. But sailing is definetly the one that consumes most of my time. 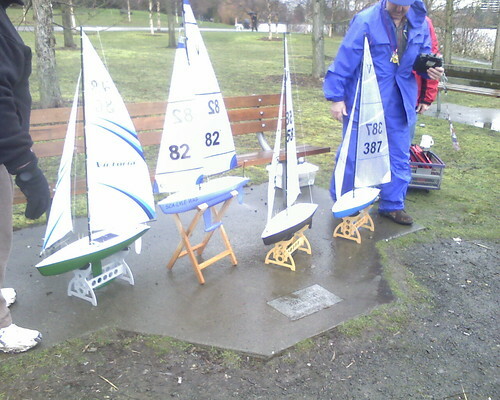 We race these little bastards on Green Lake in Seattle on the last Sunday of each month. North end of the lake. I race the Victoria Class boats. They are fun, and relatively cheap to build, compared to other RC model boats. I built mine for around $200-$250 including radio.